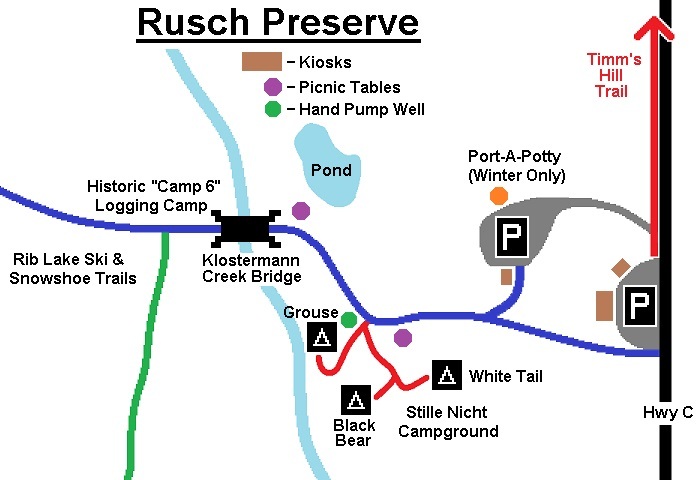 The Stille Nacht Campground is located in the Rusch Preserve at the Southern Terminus of the Timm's Hill Trail on Hwy C in Taylor County, where the trail connects with the Ice Age Trail and the Rib Lake Ski & Snowshoe Trails. The Stille Nacht Campground is the only place on the Timm's Hill Trail where camping is permitted. See the on the Trail Map and on the Rusch Preserve Map. There are three rustic camp sites that are available for free public use year-round. To reserve the campsites, send an email to tht.info@timmshilltrail.com. You do not have to reserve the campsites to use them. When not reserved, the campsites are available on a "first-come, first-served" basis. camp in the Rusch Preserve, either in one of the campsites or in a nearby location as acceptable by the hiker.